Intradiskal (intradiscal) electrothermal therapy (IDET), or intradiskal electrothermal annuloplasty (IDEA), is a minimally invasive technique for the treatment of diskogenic low back pain. IDET involves the percutaneous threading of a flexible catheter into the disk under fluoroscopic guidance. The catheter, composed of thermal resistive coil, heats the posterior annulus of the disk, causing contraction of collagen fibers and destruction of afferent nociceptors. Ideal candidates are patients with a single affected disk as determined by magnetic resonance imaging (MRI) and diskography. Patients with the predominant complaint of axial pain with or without some nonradiating limp pain are suitable candidates. Patients with severe radicular symptoms due to a herniated disk or patients with severe spinal stenosis are not good candidates. A severely collapsed disk (>50% of disk height lost) might not respond well to IDET treatment because of technical difficulties in catheter placement and the procedure's questionable effect on high-grade disk injury. Similarly, severely disrupted disk morphology as revealed by diskography may not respond well. Patients older than 55 years may have lower success rates because of poorer healing. Cigarette smoking may affect annular collagen tissue and hinder adequate recovery following the procedure. Breakage of heat-sensitive hydrogen bonds of the collagen fibers causes collagen contraction. With disk temperatures reaching 650°C, collagen may contract as much as 35% from its original size. The tightening of annular tissue may enhance the structural integrity of degenerated disk and repair the annular fissures. The process of disk restructuring (as shown by time courses of patients' pain relief) may take several months to reach its full extent. IDET might also cause destruction of sensitized nociceptors in the annular wall. Denervation by thermal energy is used widely for peripheral and central nervous system (CNS) lesions and might contribute to partial initial pain relief following the IDET procedure. The technique for approaching the disk in IDET is similar to the technique used for diskography. 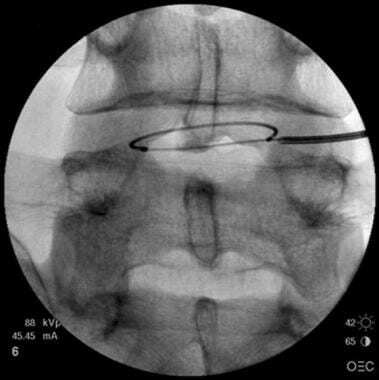 After the skin is infiltrated with local anesthetic, a 17-gauge introducer needle is inserted into the disk under the guidance of oblique fluoroscopy. 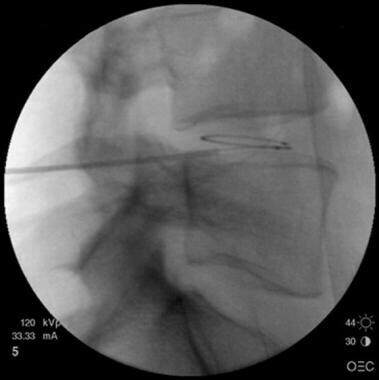 Anteroposterior fluoroscopy view shows the introducer needle in the disk. A transpedicular approach was used to access the disk. 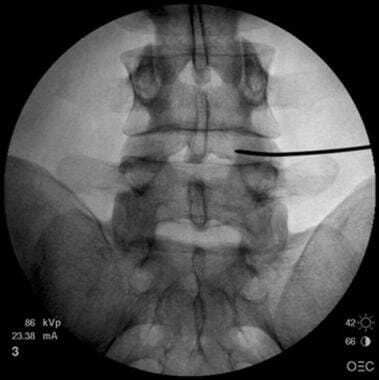 Lateral fluoroscopy view shows the introducer needle in the disk. Anteroposterior fluoroscopy view shows the catheter around the inner surface of the posterior annulus. Lateral fluoroscopy view shows the catheter around the inner surface of the posterior annulus. 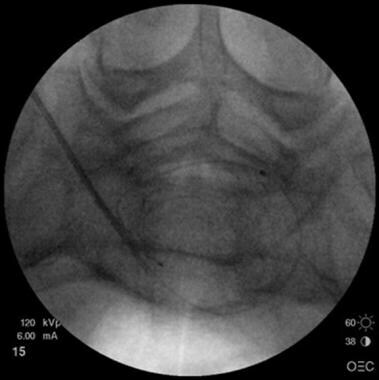 Axial fluoroscopy view shows the catheter around the inner surface of the posterior annulus. Once the catheter is in satisfactory position, it is heated from 37°C to 65 °C. After the temperature has remained at 65° for 1 minute and the patient has not complained of excessive pain, the temperature is increased by 1°C every 30 seconds until it is between 80° and 90°C. The actual temperature of the annular tissue is as much as 15°C lower than the temperature of the catheter tip. Comprehensive patient and cadaver temperature mapping studies have shown the safety of placing heating catheters within the disk tissue. In these studies, the temperature of the epidural space reached a maximum of 39.30°C when the catheter tip was heated to 90°C. In the same studies, the disk tissue reached a maximum temperature of 72°C and the outer annulus 46°C with catheter tip temperatures of 90°C. The practitioner must realize, and must point out to the patient, that recovery is gradual. During the first 7 days after the procedure, patients might experience a significant increase in pain. Significant pain relief may take 8-12 weeks. The healing process reaches its peak 4 months after the procedure. During that period, the patient must limit physical activity and follow a carefully structured rehabilitation program. In general, patients should not return to any kind of heavy physical work during the first 4 months following the procedure. A gradual increase in daily activities is recommended. The patient should do only minimal sitting or standing during the first few days after treatment, and a corset should be worn during the first 6 weeks. Athletic activities can be resumed gradually starting 6 months after the IDET procedure. The progression of activities after IDET is illustrated in the following sample rehabilitation program. Karasek and Bogduk, in a case-controlled study, compared the outcomes of 35 patients treated with IDET with those of 17 patients who were unable to undergo IDET because of lack of insurance coverage. The control group underwent a comprehensive, conservative regimen, which included physical therapy, strengthening, conditioning exercises, and education. This group was monitored for 3 months. The patients in the treatment group underwent IDET and were monitored for 1 year. In the control group, only one patient had significant improvement 3 months after treatment, three had modest improvement, four had no improvement, and nine had worsening of their condition. Visual Analog Scale (VAS) pain scores were not improved. Only one of the five patients who were working prior to starting the study returned to work. Analgesic use was not affected significantly. In the IDET group, 32 of 36 patients had statistically significant decreases in VAS scores 12 months after treatment. In the treatment group, 60% had at least a 50% reduction in pain; 23% experienced complete pain relief; and all patients returned to work or continued to work. Of the 19 patients who had at least 50% pain relief, 11 discontinued opioid medication and five continued opioids at lower doses. Saal and Saal completed a prospective case series of patients with 1 year of follow-up. Sixty-two patients were selected for IDET from a pool of 1116 patients with low back pain who did not respond to at least 6 months of aggressive conservative care. Outcomes were analyzed by using preprocedural and postprocedural VAS, SF-36, and return-to-work status. Of the 62 patients treated, 44 improved their VAS by a mean of 3 points. Physical function scores improved in 71% of the patients and showed a mean change of 20. Bodily pain scores improved in 74% of the patients, with a mean change of 17.4, and 92% of the patients returned to work. Shadid et al studied 145 consecutive patients referred for IDET after having positive diskography findings for diskogenic back pain. Of these, 120 were available for follow-up (mean, 18 months). The average duration of preprocedural symptoms was 39.8 months. Scores on a numerical rating scale and activity levels were monitored. Overall, approximately one third of patients improved, one third remained unchanged, and one third became worse. Fifty-five percent of the patients stated that they would not repeat the procedure. Animal studies have been reported. In one such study, posterolateral anular lesions were experimentally induced and allowed to mature for 12 weeks in the intervertebral disks of sheep. IDET was performed in an attempt to denervate and repair the annular lesion. The histologic and immunohistochemical effects of IDET were studied. Vascular granulation tissue and posterior anular neoinnervation were observed in the experimentally induced posterolateral anular lesions. IDET delivered at 90°C in the sheep consistently heated the posterior annulus and the nucleus to a temperature normally associated with coagulation of nociceptors and collagen contraction. IDET did not denervate the posterior annular lesion. Thermal necrosis was observed within the inner anulus and adjacent nucleus from 6 weeks after IDET. The reported benefits from IDET appear to be related to factors other than denervation and repair. IDET-induced stress concentrations in disks obtained from cadavers have been analyzed. These studies revealed that IDET has a significant but inconsistent effect on compressive stresses within intervertebral disks. This may provide a partial explanation for the variable success of IDET. A prospective study was conducted to evaluate improvements in pain and disability in worker's compensation patients with discogenic low back pain who underwent treatment with the IDET procedure. The study of 53 patients revealed that IDET can be a useful, safe, and cost-effective option in the management of carefully selected workers' compensation claimants who have discogenic chronic low back pain. A single-arm, prospective clinical trial evaluated back pain severity, physical function, and quality of life outcomes in 56 highly selected patients with lumbar diskogenic pain. The patients were treated with IDET and monitored for an average of 20.5 ± 4.4 months. Various outcomes were assessed, including back pain severity by VAS; sitting, standing, and walking tolerances; and health-related quality of life (measured with SF-36). Pain scores and functional tolerance improved, and seven of eight quality-of-life domains showed significant improvement over baseline evaluations. Complications due to IDET are infrequent. In a retrospective study, the complications of 1675 IDETs performed at 5 different spine centers were reviewed. In the same study, data related to 35,000 SpineCATH intradiscal catheters from the medical device reports (MDRs) of the United States Food and Drug Administration (FDA) were analyzed. A total of six nerve root injuries were reported, all but one of them occurring at the time of disk puncture. Five of the six completely resolved, and one case was resolving. No cases of diskitis were reported. Six cases of post-IDET disk herniation were reported at the treated level 2-12 months after treatment. Four resolved with nonoperative care, and two required disk excision. Nineteen cases of catheter breakage were reported. All were associated with repeated catheter manipulation that resulted in kinking. In 16 of these, the catheters were left in the disks; none of these cases was associated with patient morbidity. Eight cases of superficial skin burn at the needle puncture site were reported. A case of post-IDET bladder dysfunction was reported. A fatal case of an unintentional dose of intrathecal cefazolin, which had been diluted in the nonionic contrast agent that was used to confirm needle placement, was reported. Cefazolin should not be mixed with the contrast agent used to document initial needle placement during diskography. Heary RF. Intradiscal electrothermal annuloplasty: the IDET procedure. J Spinal Disord. 2001 Aug. 14(4):353-60. [Medline]. Saal JS, Saal JA. 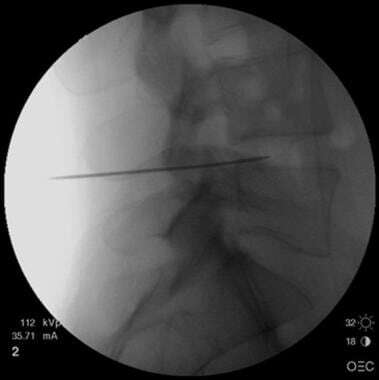 Management of chronic discogenic low back pain with a thermal intradiscal catheter. A preliminary report. Spine. 2000 Feb 1. 25(3):382-8. [Medline]. Karasek M, Bogduk N. Twelve-month follow-up of a controlled trial of intradiscal thermal anuloplasty for back pain due to internal disc disruption. Spine. 2000 Oct 15. 25(20):2601-7. [Medline]. Saal JA, Saal JS. Intradiscal electrothermal treatment for chronic discogenic low back pain: a prospective outcome study with minimum 1-year follow-up. Spine. 2000 Oct 15. 25(20):2622-7. [Medline]. Shadid A, Derby R, et al. An independent assessment of the one to two year clinical outcomes of intradiscal electrothermal anuloplasty (IDET) for discogenic low back pain. Presented at International Spinal Injection Society 9th Annual Scientific Meeting. September 2001. Pauza KJ, Howell S, Dreyfuss P, et al. A randomized, placebo-controlled trial of intradiscal electrothermal therapy for the treatment of discogenic low back pain. Spine J. 2004 Jan-Feb. 4(1):27-35. [Medline]. Freeman BJ, Walters RM, Moore RJ, Fraser RD. Does intradiscal electrothermal therapy denervate and repair experimentally induced posterolateral annular tears in an animal model?. Spine. 2003 Dec 1. 28(23):2602-8. [Medline]. Pollintine P, Findlay G, Adams MA. Intradiscal electrothermal therapy can alter compressive stress distributions inside degenerated intervertebral discs. Spine. 2005 Mar 15. 30(6):E134-9. [Medline]. Jawahar A, Brandao SM, Howard C, Nunley PD. Intradiscal electrothermal therapy (IDET): a viable alternative to surgery for low back pain in workers' compensation patients?. J La State Med Soc. 2008 Sep-Oct. 160(5):280-5. [Medline]. Maurer P, Block JE, Squillante D. Intradiscal electrothermal therapy (IDET) provides effective symptom relief in patients with discogenic low back pain. J Spinal Disord Tech. 2008 Feb. 21(1):55-62. [Medline]. Andersson GB, Mekhail NA, Block JE. Treatment of intractable discogenic low back pain. A systematic review of spinal fusion and intradiscal electrothermal therapy (IDET). Pain Physician. 2006 Jul. 9(3):237-48. [Medline]. Freedman BA, Cohen SP, Kuklo TR, et al. Intradiscal electrothermal therapy (IDET) for chronic low back pain in active-duty soldiers: 2-year follow-up. Spine J. 2003 Nov-Dec. 3(6):502-9. [Medline]. Saal JA. IDET related complications: a multi-center study of 1675 treated patients with a review of the FDA MDR data base. Presented at International Spinal Injection Society 9th Annual Scientific Meeting. September 2001. Boswell MV, Wolfe JR. Intrathecal cefazolin-induced seizures following attempted discography. Pain Physician. 2004 Jan. 7(1):103-6. [Medline]. Assietti R, Morosi M, Migliaccio G, Meani L, Block JE. Treatment of discogenic low back pain with Intradiscal Electrothermal Therapy (IDET): 24 months follow-up in 50 consecutive patients. Acta Neurochir Suppl. 2011. 108:103-5. [Medline]. Tsou HK, Chao SC, Kao TH, Yiin JJ, Hsu HC, Shen CC, et al. Intradiscal electrothermal therapy in the treatment of chronic low back pain: Experience with 93 patients. Surg Neurol Int. 2010 Aug 4. 1:[Medline]. [Full Text]. Assietti R, Morosi M, Block JE. Intradiscal electrothermal therapy for symptomatic internal disc disruption: 24-month results and predictors of clinical success. J Neurosurg Spine. 2010 Mar. 12(3):320-6. [Medline]. Lu Y, Guzman JZ, Purmessur D, Iatridis JC, Hecht AC, Qureshi SA, et al. Nonoperative management of discogenic back pain: a systematic review. Spine (Phila Pa 1976). 2014 Jul 15. 39 (16):1314-24. [Medline]. [Full Text]. Derby R, Lee SH, Seo KS, et al. Efficacy of IDET for Relief of Leg Pain Associated with Discogenic Low Back Pain. Pain Pract. 2004 Dec. 4(4):281-5. [Medline]. Houpt JC, Conner ES, McFarland EW. Experimental study of temperature distributions and thermal transport during radiofrequency current therapy of the intervertebral disc. Spine. 1996 Aug 1. 21(15):1808-12; discussion 1812-3. [Medline]. Stamuli E, Kesornsak W, Grevitt MP, Posnett J, Claxton K. A Cost-Effectiveness Analysis of Intradiscal Electrothermal Therapy Compared with Circumferential Lumbar Fusion. Pain Pract. 2017 Sep 12. [Medline]. Kircelli A, Coven I, Cansever T, Sonmez E, Yilmaz C. Patient Selection and Efficacy of Intradiscal Electrothermal Therapy with Respect to the Dallas Discogram Score. Turk Neurosurg. 2017. 27 (4):623-630. [Medline]. Helm Ii S, Simopoulos TT, Stojanovic M, Abdi S, El Terany MA. Effectiveness of Thermal Annular Procedures in Treating Discogenic Low Back Pain. Pain Physician. 2017 Sep. 20 (6):447-470. [Medline].